The reason why quail eggs are seen as a holy grail of health is because not everyone is looking to put in the effort necessary to improve their health. Instead, they are looking for that one food that could miraculously revert the effects of all of their bad dietary habits and boost their health. But true health is an everyday conscious effort to eat clean and enjoy a balanced and varied diet. So before you completely disregard chicken eggs, know there are a lot of unjustified claims regarding the nutritional superiority of quail eggs which are actually not that much better for your health. 1) Quail eggs have good cholesterol, chicken eggs have bad cholesterol. There is no such thing as good and bad dietary cholesterol. There is only one type of cholesterol from food and it’s the same in all animal products from beef and dairy to chicken, duck, quail and all eggs. It’s the cholesterol in our blood that is classified as good or bad, depending on its effects on our health. Cholesterol from food is simply an essential nutrient we need, albeit in smaller amounts. And the reason it’s not bad for you is because it is not all just converted directly into blood cholesterol after digestion, serving no other purpose. Instead, cholesterol from food is used to make digestive enzymes, synthesize hormones that impact fertility, neurotransmitters that regulate mood, appetite and sleep and synthesize vitamins. Blood cholesterol on the other hand takes on both positive and negative attributes because it’s a result of how much excess weight we have from eating too much of anything and thus mirrors our general health. It’s not cholesterol from food that is bad for you, but other fats and sugars that cause weight gain and disease, resulting in cardiovascular problems such as high blood cholesterol or diabetes. So know that quail and chicken eggs have the same cholesterol and it’s good for your health in small amounts. The reason why quail eggs have more cholesterol than chicken eggs is because quail eggs have a higher yolk-egg white ratio and cholesterol and other fats are found in the egg yolk. So you get both more egg yolk and cholesterol and other fats from eating quail eggs than from eating chicken eggs (read more about the properties and benefits of dietary cholesterol). 3) Quail eggs are better for diabetes. Not really. Actually, neither quail nor chicken eggs help treat diabetes and most sufferers are advises to avoid eating eggs of any kind. This is because diabetes is often brought on by weight gain which is a result of eating too much of anything. Eating more high fat foods foods that are moderately rich in calories like eggs could further add to the weight gain. Not to mention that most diabetics suffer from high blood cholesterol and should not eat foods rich in calories. Instead, eggs are potentially good for high blood sugar levels because they have lots of protein and fat which take longer to digest than carbohydrates. As a result of this, eating eggs lengthens digestion time and, implicitly, causes a steadier, more controlled rise in blood sugar levels, which can be good for diabetes sufferers. Still, it is important to talk to your doctor first and ask how many eggs you should eat per week given you condition. Because they are already rich in fats and moderately rich in calories, they could lead to more weight gain which is not good for diabetes. 4) Chicken eggs raise blood cholesterol, quail don’t. Studies show dietary cholesterol does not directly raise blood cholesterol levels. Instead, excess sugars and fats from high-calorie foods do via weight gain. Weight gain is essentially the result of excess calories from food, especially calories from sugars and fats that are being deposited as fat tissue in the body. Too much body fat negatively impacts all systems and organs because it requires the entire body to cope with excess fat deposits, including the cardiovascular system. So eating quail or chicken eggs in moderation will not cause high blood cholesterol, but eating too much of either could up your intake of fats and calories, cause weight gain and possibly lead to high blood cholesterol. 5) Quail eggs treat allergies. Quail eggs appear to be less allergenic than chicken or duck eggs and could potentially attenuate allergic rhinitis symptoms in certain people. But while there is reason to eat quail eggs if you are more sensitive to other egg varieties, that does not make them a treatment for allergies. Allergies are a complex, immune system-mediated and serious medical condition that is best managed by avoiding the triggering allergen and having essential medication with you at all times. 6) Quail eggs are more nutritious than chicken eggs. Both varieties actually have just about the same amounts of vitamins and minerals. Quail eggs have slightly more protein, fat and cholesterol. But since eating too much fat is not healthy, you would have to eat slightly less quail than chicken eggs to get the same amount of fat and would end up getting about the same nutrition too. In any case, the slight difference in nutritional value does not produce significant differences in terms of health effects. 7) Quail eggs don’t have salmonella. Any egg can harbor pathogenic bacteria, including quail. The risk of Salmonella infection from raw or undercooked quail eggs is the same as that from raw or undercooked chicken or any other eggs. 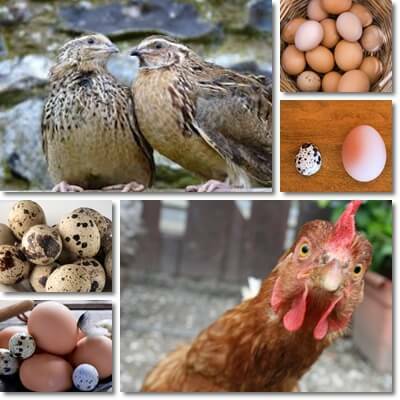 Just because there have been more reported cases of foodborne disease from chicken eggs, that doesn’t mean that quail eggs are a lower risk (read more about the properties and benefits of quail eggs). Actually, in Asian countries where they are preferred over chicken eggs, there are quite a lot of reports of Salmonella infections from quail eggs. And until they become as big a part of the Western diet as they are of traditional Asian diets, there is no comparison. In any case, eggs are best eaten well cooked. Raw, undercooked or improperly handled eggs of any kind are potential sources of foodborne disease. Conclusion. Overall, there are little nutritional differences between quail and chicken eggs, except for quail eggs having more than double the cholesterol. Which is not always a bad thing because dietary cholesterol doesn’t raise blood cholesterol levels directly, or all by itself. So when it comes to choosing quail or chicken eggs, know that neither has significantly more health benefits than the other, when part of a balanced and varied diet that promotes clean eating. Cholesterol there is good and bad cholesterol according to the lab report. The cholesterol in eggs is neither HDL nor LDL. It’s more like a free form of cholesterol. Only cholesterol in your body can be referred to as HDL or LDL. Cholesterol in the body is attached to various lipoproteins, hence the names HDL (high-density lipoprotein) and LDL (low-density lipoprotein). What these lipoproteins do is transport cholesterol (essentially a fat) throughout the body and determine what the cholesterol does, where it goes. HDL takes cholesterol out of cells, tissues and especially blood and returns it to the liver. So it prevents accumulations that could cause ill health over time. This is why it’s referred to as good cholesterol. At the same time, it moves cholesterol to important sites to produce essential hormones like cortisol, progestogens, estrogens, androgens or vitamin D derivates. But uptake is regulated closely by HDL cholesterol uptake receptors, so there is never any excess that could cause disease. LDL collects within blood vessels and can form deposits that may limit blood flow over time. High LDL can cause heart attacks or stroke. And you need good amounts of HDL to extract excess LDL and maintain a balance. So the cholesterol in eggs is neither HDL nor LDL and it’s not bad for you. Believe it or not, it’s actually good for you because cholesterol is an essential nutrient (it makes up the protective coating of nerve cells called the myelin sheath and offers protection against diseases like multiple sclerosis, synthesizes vitamin D for the immune system etc.) and doesn’t have calories. Not to mention not very much of it is actually absorbed from food. So you can eat moderate amounts of eggs, according to your individual nutritional requirements. The extra benefit is that you’ll get excellent amounts of quality protein with all essential amino acids, important B vitamins like vitamins B9, B12 and choline, vitamins A, D, healthy Omega-3 fatty acids and other vitamins and minerals. Hope this helps and wishing you lots of health, Randy.